Fully automated manufacturing has become the industry standard for large automotive and aerospace organisations, but there is currently a serious lack of support for SMEs trying to develop their own processes using similar technologies, and we aim to fill this need. In this rapidly changing world, British industry needs to develop its manufacturing to become much more competitive than it is at present. The government has set up various funding streams that aim to support this type of development, but unfortunately, the new organisations that have access to this funding have provided research environments for large scale projects within large organisations, whilst totally failing to support the SMEs which need the most help. This is where we aim to provide our service of “affordable automation research” to help implement new ideas in the shortest time possible. We have experienced the difficulties some large organisations have in delivering cutting edge research, as they are hampered by their own financial models and procedures. We will aim to enable a rapid response to all research requirements. We will focus on education and a community approach to provide a “sandbox” for people to come and exchange ideas, while providing a basic set of equipment including CAD tools for design and process simulation, but also a range of robots for real try-out. Autosim Engineering Ltd is a company currently providing a Robotic Automation Simulation and Engineering Design consultancy service. The Wiltshire Industrial Robot Centre will be an organisation dedicated to providing services to support all types of business, large and small, that have a requirement to develop or implement automated robotic processes. Our philosophy is to further knowledge and introduce a broad range of manufacturing, construction and service industries to the benefits of automating their processes. Our centre will be equipped with software and hardware to enable fast and reactive support for the development of cutting edge research into automated processes. 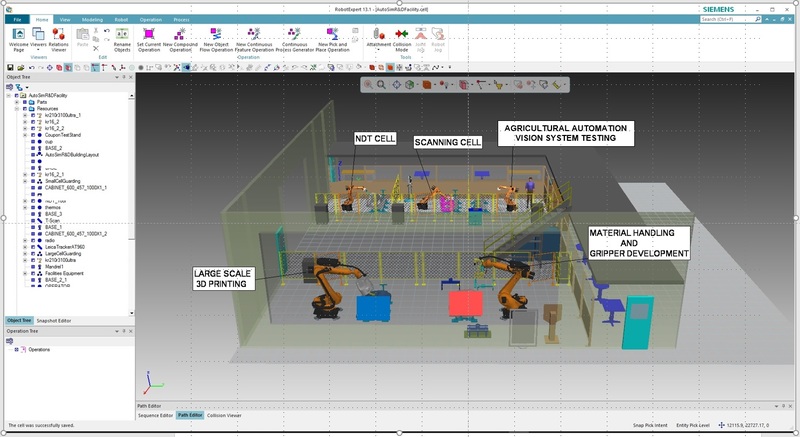 Our chief aim is to provide access to “Affordable Automation Research” by complimenting the above mentioned design and simulation services with a robot cell rental service, where customers can hire robotic equipment on a daily or weekly basis. We will provide support and expertise for them to try-out and test new systems and tooling to develop their own manufacturing processes. We will also provide a range of services through concept design by CAD simulation, robotic tooling design, process and tooling design verification by simulation, off-line programming, real robot try-out, real process try-out and a range of training services. We aim to set up the organisation as an open access centre where customers are invited to rent our equipment and our experienced engineers as suits their requirements. We plan to invite our customers, including academic organisations and schools to book for free any time periods of less than half a day, thus allowing full access to the whole community. For more confidential work we have developed a range of fast-build robot systems that can be deployed into any of our customer’s premises.